Completely Healthy Cookies?? Yes, Please!! I’ve been on the search for a cookie that had no sugar, no flour and only healthy ingredients I would have readily available, while still being the yummalicious treat that a cookie is meant to be. “Penny Pinching Peach is a participant in the Amazon Services LLC Associates Program, an affiliate advertising program designed to provide a means for sites to earn advertising fees by advertising and linking to Amazon.com” There may be other affiliate links to help my family while helping yours! In a large mixing bowl , mash bananas with a fork until smooth. Stir in oil, peanut butter, milk and vanilla extract. 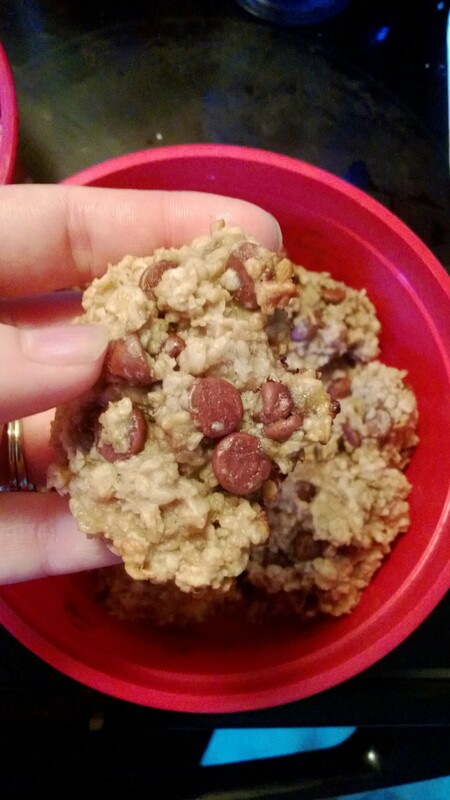 Next, mix in oats and chocolate chips until well coated. Lightly spray cookie pan with cooking spray. Drop dough by heaping spoonfuls on the cookie pan . Bake for about 15 minutes. Variations: Add 1/2 tsp. 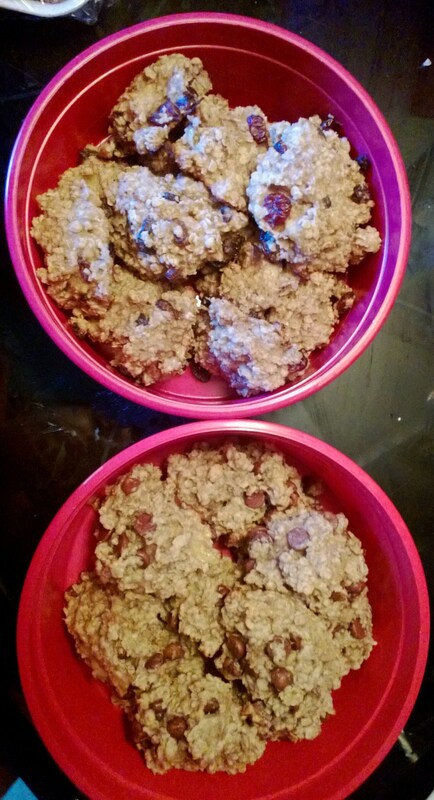 cinnamon and 1/2 cup craisins or raisins in place of the chocolate chips and peanut butter. 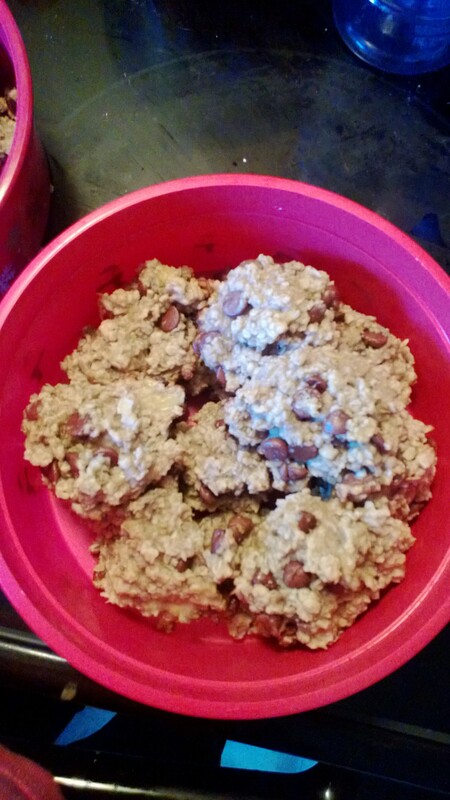 Add coconut and/or walnuts with or in place of the chocolate chips and peanut butter. Enjoy! If you have any left by the time they cool, you could store them in an adorable cookie jar like this chalkboard cookie jar ! This is a delicious cookie by regular standards. 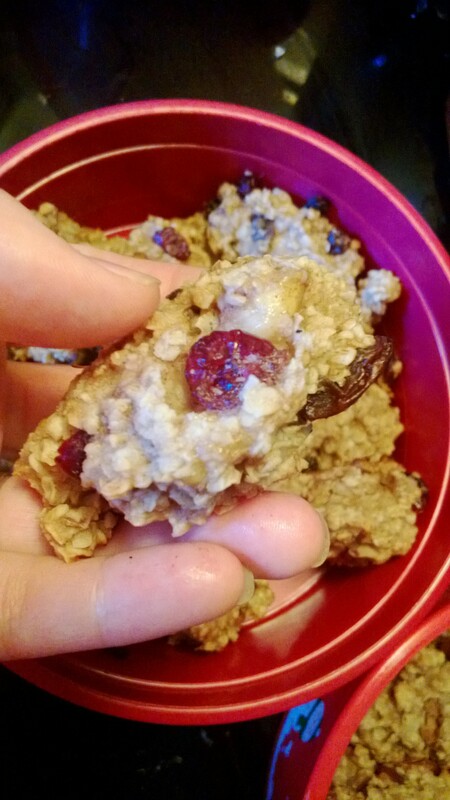 I won’t cook “health food” that tastes like crud on a stick, so trust this southern gal that these are yum-yum-yummy by the standards of those of us who are not well adapted to cookies tasting like tree bark. 🙂 You don’t even miss the sugar at all. It’s also such a simple enough recipe to whip up that it’s a great choice for cooking with kids. That’s huge for me, since my 4 year old loves helping Mommy whip up some goodies to share. If you’ve been on the search for a kid approved, man approved, southern fried chick approved treat that happens to be extremely healthy and penny pinching friendly, this is the recipe for you! 🙂 What kind of goodies do you wish you could find a healthy and delicious version of? Are there any that you have tested yourself that passed the taste test as well as the health test? Want more ideas? Check out my ideas for some fun Healthy Snacks and After School Snacks! Categories: Cooking With Coupons, Frugal Family | Tags: banana cookies, cookie recipe, cooking with kids, flourless cookies, health food, healthy cookie recipe, oatmeal cookie recipe, oatmeal cookies, peanut butter cookies, sugar free cookies | Permalink. Wish I found this about an hour ago! I am going to try these next. But can you tell me what the milk does for the recipe? It just adds that little bit of moisture lacking in the rest of the ingredients. You should be able to just substitute apple juice, orange juice or even possibly water if you don’t want to use milk. These are amazingly good, healthy and a great thing to keep you full between meals. Thanks! I am always looking to get rid of butter, eggs and most flour and I never understand what certain ingredients do so that I know how I should substitute. This recipe looks like a winner to me. Pingback: Car & Travel-Friendly Recipes For Children - Mom, Are We There Yet? Canola oil is incredibly unhealthy. You have a point. I hadn’t heard that when I created this recipe. I have successfully use apple sauce instead of it. I may need to revise for that.